Yes, it was laksa, again. I knew I had already posted laksa in the Low-Fat Singapore Laksa recipe, but this laksa recipe was more like a review of the ‘All-in-One curry laksa paste pack’. My mother, who loved curry laksa, recommended this laksa paste of Prima Taste brand. With good reference, I did not hesitate to pay $5.75 for a pack of laksa paste. This laksa pack comes with coconut milk in powder form. Other than the laksa paste and coconut milk, it also includes sambal chili (chili paste), and dried coriander leaves for garnishing. This makes laksa-making process an easy one. Hassle-free, and most suitable for quick home-cooking. And yes, the taste was good, indeed. Aromatic curry with intensive coconut milk flavour. It’s available at most of the major supermarkets (in SG). 1) Pour water into a pot. Dissolve packet of coconut milk powder (called ‘Laksa Premix’ in the package) into water. 2) Bring liquid mixture to a boil over medium-high heat. Add laksa paste. Bring to a boil again. Add in “Tao Pok“. Reduce heat, and simmer for 30min. Cover pot with lid. 3) Meanwhile, use another pot, add water, hard boil the eggs. She’ll the hard boiled egg when cooled. Reserve. 4) Clean the pot, boil a pot of water, add pinch of salt. Blanch rice noodles and all other side ingredients, except for cockles to be remained raw or simply run through the hot water and drain. 5) Divide noodles among bowls, and top with all side ingredients including raw cockles. Pour over hot laksa broth. Garnish with dried coriander leaves and sambal chili. Serve. This package costs almost double the price of most of the curry pastes. Taste was guaranteed here. It was worth a try, esp to save you from measuring the right amount of required seasoning. You should be able to get the dish served within 40min. Calories-count for it, about 550kcal per regular bowl. Tips: Visit Prima Taste Online store here, if interested. Just for your reference. *Cooking directions are clearly stated on the packaging, too. *Raw cockle will be rare-cooked by pouring over hot curry gravy, to retain its juiciness. However, go ahead to blanch it, as desired. Just expect some shrinkage and drier meat. This dish sounds like the whole package: pretty, tasty and filling. Lovely! Thanks Lore! Give it a try! i love laksa! love both the normal and the katong ones too. your dish looks yummy. i’ve tried other Prima sauces but not this one yet.. thanks for the tip. i posted my Easy Peasy Shrimp Paste Chicken oredi. Do check it out. muaks! That laksa looks really tasty! 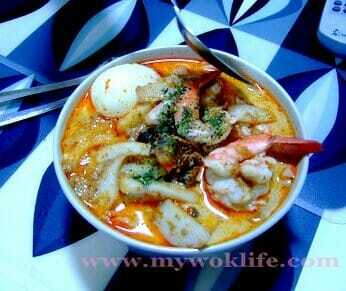 How to have laksa without Sambal!. I personally prefer using kcal and it’s quite common to be known to many readers with kcal, to me. More comfortable with it. 1 Calorie (technically kiloCalorie) = energy value of 4.186 kilojoules (kJ).